I thought I had seen Food Matters before, but after watching it last night I realized I hadn’t seen it before, but I wish I had since it is an amazing documentary! I learned a lot about how much food matters, and how through juicing and vitamins, you can reverse cancer and other chronic diseases. I immediately emailed my mom and told her to watch it, so she did today and is now going to get an IV of vitamin C, which is proven to shrink cancerous tumors, and it works on all cancers. Very interesting information. I also learned that at least 51% of what you eat should be raw, so more salads and fruits and less cooked food. Raw food is needed for the enzymes that your organs need to break down food and absorb the nutrients. Very interesting stuff. 🙂 You are what you eat. So today I went grocery shopping and cooked dinner from scratch for the first time in awhile. 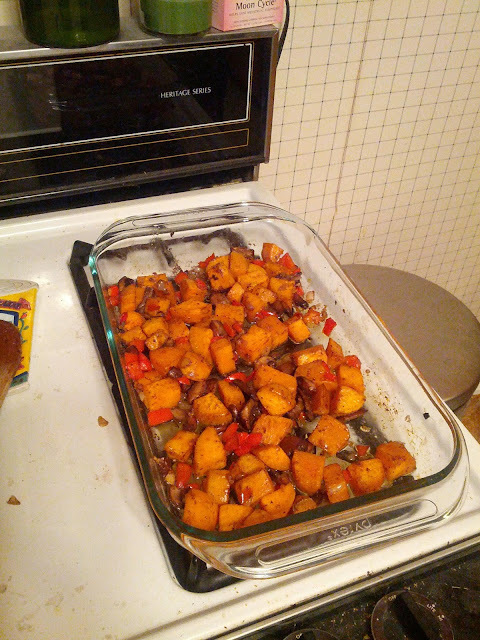 I made this recipe I found called Roasted Sweet Potato and Vegetable Combo. I changed it up slightly by adding in some cinnamon, cayenne pepper, pepper, and some sugar. It turned out delicious and I would definitely make it again.